With twenty days down and ten to go we come upon K. M. Alexander and his latest release, Old Broken Road. Click on the image for more info or to order a copy. It’s called the Broken Road. A long abandoned route veiled in rumor, only spoken of in whispers. Some claim that bandits stalk its overgrown path, while others speak of a city of cannibals. Stories tell of dark apparitions, bizarre monsters, and ancient evils. One thing is certain: no one goes near it. 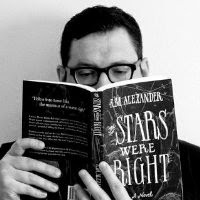 K. M. Alexander is a Pacific Northwest native and novelist living and working in Seattle with his wife and two dogs. Follow his exploits at http://blog.kmalexander.com.